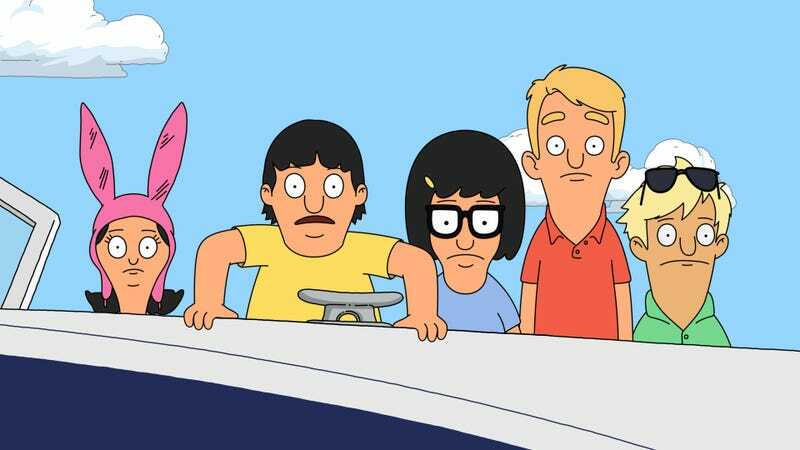 Bob's Burgers offers the one thing more annoying than Gene: Yacht people! Gene Belcher is annoying. He’s loud, self-obsessed, and not especially bright. That isn’t a problem when he’s a supporting player to Tina or Louise’s antics, content to make alternately hilarious and bizarre observations off on the side of a story. But the task gets tougher when he’s the focus of the story, which Bob’s Burgers implicitly acknowledges by only rarely actually making him the center of an episode’s attention. When the show does go ahead with a Gene episode, a common solution is to put him opposite an even more enervating character—say hi, Wheeler family! But “What About Blob?” chooses a trickier path by openly and repeatedly pointing out in the story itself that Gene is getting on everybody’s nerves. The bold new noise he has discovered is so aggravating that it makes even Mr. Frond seem instantly sympathetic when he orders Gene to stop, and the family can’t even pretend to fake being supportive of Gene’s latest absurd obsession. Even when he becomes so upset with everyone’s refusal to understand his outsider genius that he stops making the noise for a while, he’s still a massive pain to his siblings, who tag along on his ridiculous adventure just because it beats cleaning the restaurant. For a moment there, it appears “What About Blob?” is going to be a straight rehash of one of the canonically great Gene episodes, “O.T. : The Outside Toilet,” with the bioluminescent blob of plankton subbing in for the Jon Hamm-voiced toilet. Instead, the episode briefly makes what points it has to about how Gene sees himself in the outwardly disgusting but secretly musical blob, and then it moves on to a Bob’s Burgers version of a snobs versus slobs comedy. The blue bloods at Glencrest Yacht Club, represented by John Michael Higgins’ shorts-clad president, are the perfect foils for the Belcher children. 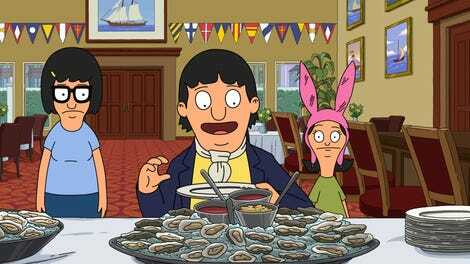 What’s especially great is that Gene puts a lot of effort into fitting in with the rich people, even if that’s mostly because he just loves oysters so much, to Tina’s ongoing horror. But he also wears a hell of a dishrag as an ascot—Bob’s right, it looks good on him—and he’s very willing to do what it takes to charm the rich yacht people on their own terms. When that inevitably doesn’t work, it’s time for Louise to step in and involve Sasha, their old Kingshead Island Speeders racing rival. What this episode does sometimes miss, with all due respect to the sometimes conniving yacht club president, is a proper antagonist. There’s no Max Flush to be found here, as this is mostly another episode where the plot can only barely be said to matter to anyone, and the kids only get as far as they do because a succession of adults can’t be bothered to put up a fight. That’s Bob and Linda defined, of course, but there’s also the greeter at Glencrest Yacht Club, who can’t be bothered to stop Louise when she and her siblings announce they are barging past, and the kayak rental woman, who ends up happy renting the craft to the kids and letting them rifle through the lost and found for disguises. This does make the episode feel more lightweight than “O.T. : The Outside Story,” but at least the episode does the work to make the adults’ indifference feel logical. After all, the kayak renter’s case is quite easily explained when you consider Sasha did give her a hundred dollars to look the other way, and it’s hard to understate how much fun the show can have when it gives Louise access to a huffy but basically malleable rich kid prepared to bankroll whatever the latest daft scheme is. It’s basically a more grounded, justified in-universe version of when The Simpsons started letting Homer randomly pull a thousand dollars out of his wallet when the kids needed it to keep the story moving. Everything that happens once Sasha and his New Zealander sidekick Duncan get involved is golden, really. The attempt to switch the yacht club’s bleach for bread crumbs features some hilarious business as Sasha bluffs his way into distracting the Glencrest employees, all while Tina keeps trying to get closer to Duncan under the guise of ankle-based agreements and possibly being a spider. The failed heist also provides multiple opportunities for Sasha to look down on the Belchers in comical fashion, from the fact they don’t realize why a yacht club would have massive supplies of Panko bread crumbs to their mistaken impression about what happens when you flush something down a yacht’s toilet. His refusal to make wake in a marina, even at the cost of being captured by the Glencresters, is a hilariously perfect character moment. His declaration that they’re not animals as he refuses to go any faster is one of those moments of perfect clarity into one of the show’s side characters, and guest voice Jon Daly nails his character’s utter indignation at the kids’ request. Even when the Belcher kids realize they can save the plankton by getting it out of the marina and Sasha raises the logical objection that the only reason he agreed to the scheme was to embarrass the rival yachters, the show and Daly have defined Sasha enough that his impromptu acceptance of Gene’s passionate argument doesn’t just feel like a handwave. Sasha’s willingness to go along with the plan helps lead into the story’s sweet ending,, at least in a Bob’s Burgers kind of way. It’s a nice callback to that thankfully forgotten noise when Louise realizes it’s what the kids can use to drive the plankton out. The yacht club president, for all his villainy, does eventually recognize that there’s no need to bleach the water with the plankton gone. And while Gene is briefly sad to see his beloved friend get immediately devoured by the fish, he finds the bright side when he realizes they can now find a home in his future oysters. Then there’s Bob and Linda’s story, in which they learn that Jimmy Pesto’s lackey Trev has hitherto unknown depths. Of all the show’s recurring side characters, Trev is probably the least clearly drawn, as all he has ever needed to be is Jimmy’s high-fiving sidekick. What this episode asks, however, is what if he didn’t want to do that? The episode seizes on the fact that Trev has always appeared far more motivated by adoration for his boss than any actual malice toward Bob. I was as pleasantly surprised as Bob when Trev came through and declined to high five the newly tanned and dreadlocked Jimmy, even if he did have to make a lame excuse about his hand being sick. Then again, Trev did immediately reveal the cavalcade of intimate secrets about Bob that Linda shared when she was play-acting as Jimmy earlier. It’s a clever way for the episode to let a character change without altering anything about the underlying dynamic. I’d be shocked if Trev’s newfound conscience carried over to future episodes, even in this hilariously weak-willed form, but the resolution is clever in that it allows for tangible change without making it feel like future episodes are ignoring anything significant if they go back on it. That’s what shifting the focus to Bob’s peehole-shaped birthmark will do, I guess. Pretty sure that’s just Writing 101. It’s a bit odd we never got to see the beautiful side of the plankton again after its initial appearance. I wouldn’t go so far as to say it undermined the episode’s sense of stakes that we didn’t get more of a connection with why Gene cared about the plankton so much, but it couldn’t have hurt to get a little more time of those two misunderstood weirdoes communing. We need more Duncan and his Kiwi-isms in our lives. As does Tina, quite clearly. Of course Teddy things Bob is afraid of long hugs because he doesn’t want to hug him specifically. That’s the most perfectly Teddy detail.